This Clairefontaine Top Bound Watercolor Pad is the last of several items that Exaclair sent to me for feedback. I want to thank Exaclair for their generosity, and for giving me the chance to share their excellent line of products with my readers. -designed for watercolor, gouache, or wash drawing. -Size: 8″ x 8″ (200 x 200 mm) Note: also comes in a 4″ x 4″ size. The pages of the Clairefontaine Watercolor Pad are smoother than most watercolor papers I’ve used. 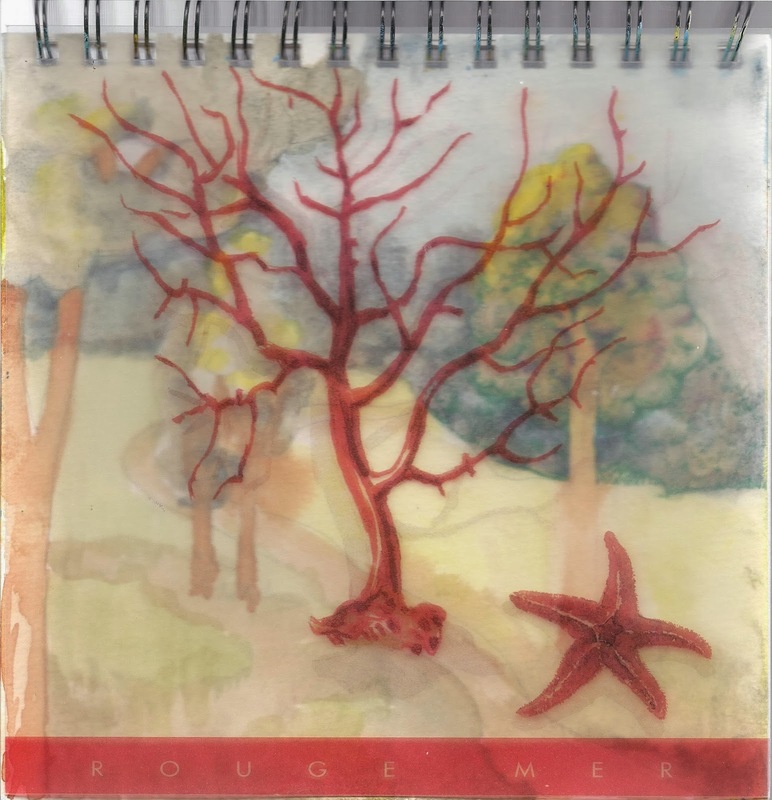 If I saw and touched the paper without knowing what it was, I would probably have guessed it was a mixed-media surface rather than watercolor. I haven’t used cold-pressed paper much, so that may be my inexperience showing. Having used this paper now, I can tell you it works very nicely for both watercolor and mixed-media. More on that later. While the paper is flexible, it is rigid enough that you need to work at it to get a permanent fold. It’s a very nice weight for journal covers. The clear polypro covers are nice and light. I don’t know that I like the transparency. The work on your first page shows through. 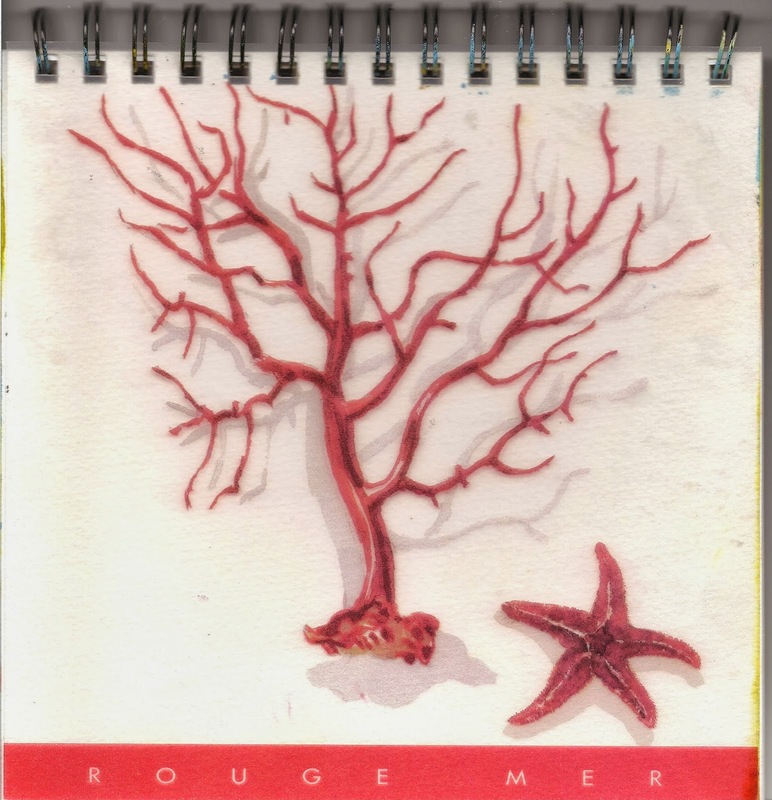 If you plan to keep your pages in the pad, then you might want to plan your first page around the red coral and starfish on the cover. The pages are not perfed, but they do tear out fairly easily. The edges then need to be trimmed. This sort of segues to the thing I like least about the pad (and that doesn’t mean I don’t like it–just that it is my least favorite feature). The slots for the wire-binding are square cut, and the wire spiral is fairly large. This gives a lot of ‘slop’ for the paper to move. It could allow your paper to move slightly while you are using it, if you were holding the pad while drawing or painting in it. It increases the wear and tear on the paper. Normally, I’d worry that might result in loose pages, but in this case, the paper is thick enough that it isn’t much concern. The wire binding is also thick enough that I had trouble getting my work to lie flat on my scanner. I ended up cutting them all out so I could get a better scan. That probably wouldn’t be an issue for many, but if you share your work online often, it could be. 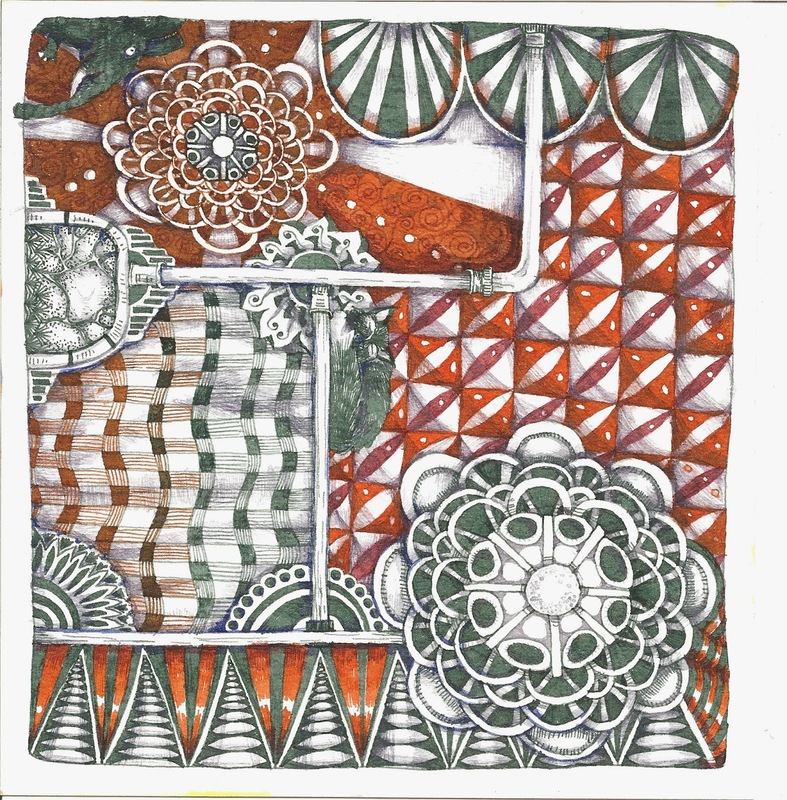 On the plus side of this issue, if you did use the pad for mixed-media collage where you added embellishments and ephemera, the larger coil and looser movement gives you plenty of room for expansion. While my personal preference is for a snugger binding, I would use a pad like this for ‘chunky’ pages. There is an additional backboard in the pad that is rigid enough for excellent support, but extremely lightweight like illustration board. Overall, despite the heavy paper, the pad if very light to carry. The paper in this pad handled everything I threw at it from heavy wet-in-wet washes to scrubbing to ironing! 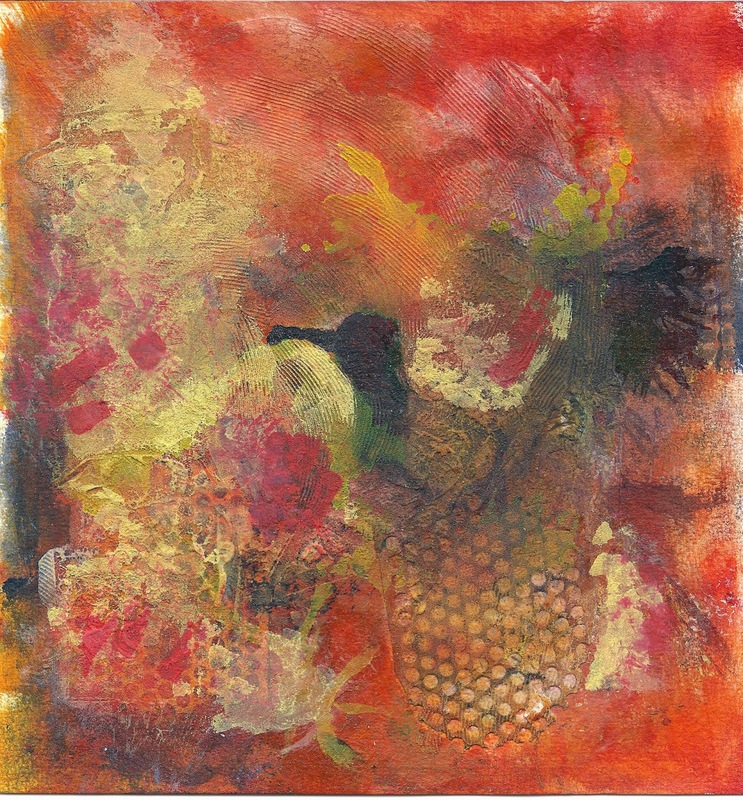 I found the color intense and bright but not brilliant, allowing a range from subtle color to rainbow pigments. I decided to try my hand at some prismatic painting exercises (see this Dory Kanter video for more about this method) feeling they’d make a good test for the paper. The prismatic painting exercise is meant to help you explore the wet-in-wet technique, keeping a loose touch. I subverted it a bit because I was testing the paper. Rather than waiting until one layer was dry before adding more paint or water, I kept adding in some spots. In some areas, I kept the paint almost dry. Despite the difference in saturation, the paper kept its shape. There was a slight curving at the edges, but I didn’t even feel the need to weight the paper down. The color lifted well where I blotted the wet paint so I was almost able to return to the original paper color. Despite scrubbing at one saturated spot, there was no pilling. Drying time seemed about average. For my second prismatic painting, I kept closer to the original spirit of the exercise, but used pigments (Lunar blue, Quinacridone Burnt Orange, French Ochre) that granulate. Since this a relatively smooth watercolor paper, I wanted to see how well the pigments separated. Very nicely, as it turned out. 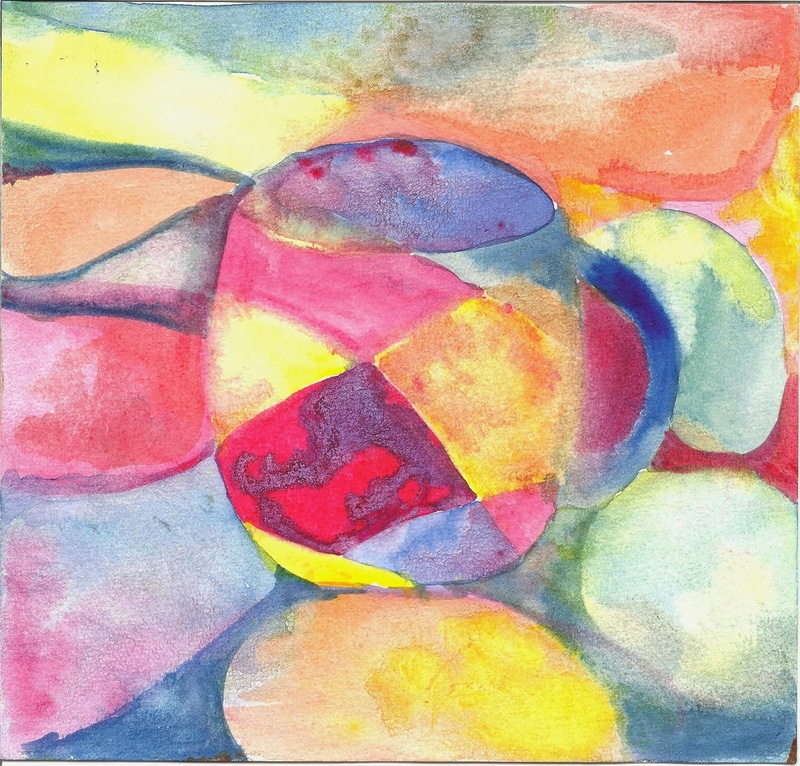 For my third watercolor, I used Gelatos, a crayon-like stick that you blend with water. I really like Gelatos, but I had some difficulty with waxiness on this paper. I had to apply a lot of water to dissolve the paint thoroughly. Next time, I think I’ll dissolve my gelato in water first, rather than applying the stick directly to the paper. I also wanted to see how fluid ink would move down the page, so I took dye re-inkers (the bottles that you use to refill your stamping inkpads) and dropped ink at the top of the page, tilting the pad afterwards to get the ink to move. Even with the wax build-up the ink move easily down the page, but it didn’t move as easily from side to side. This page is destined to end up as a map-themed work. I have an idea of what I want but I’m not sure how I’ll get there. I was quite pleased with the way colored pencil went down on this paper. It would take a bit of work to get dark solid color, but you could easily build up layers to get a fantastic blend. 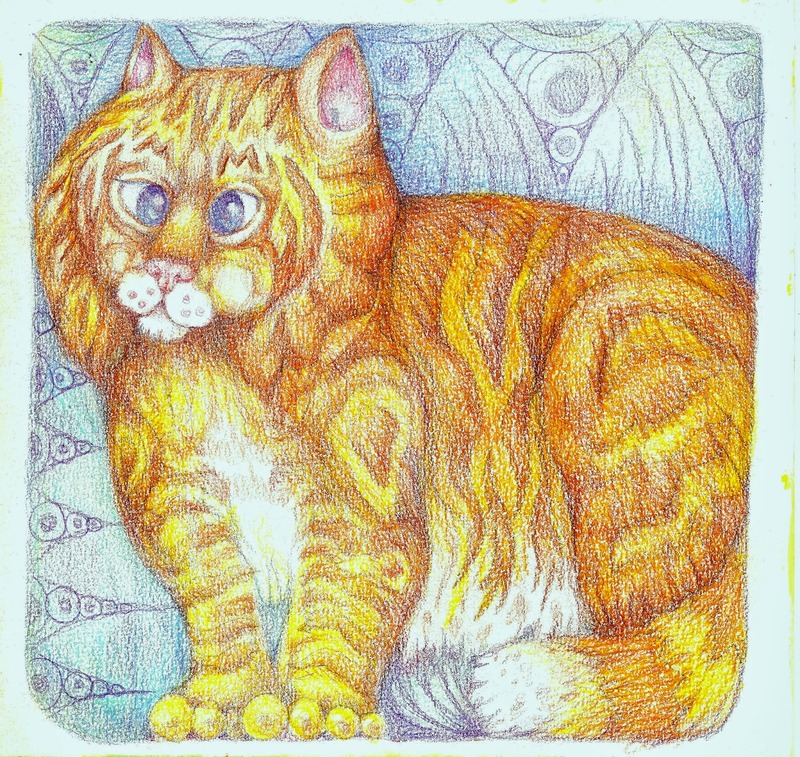 Usually, I have trouble getting my pencil colors to scan, but they picked up well this time. J. Herbin fountain pen inks are intense in color anyway, but they are especially bright on this paper. It did take me a while to get solid coverage, which is not unexpected given the amount of tooth. This pad wouldn’t be my first choice for pen and ink, but I wouldn’t hesitate to use it for such. As I’ve said, my first impression of this pad was that it would be great for mixed media, so of course I had to try it out. 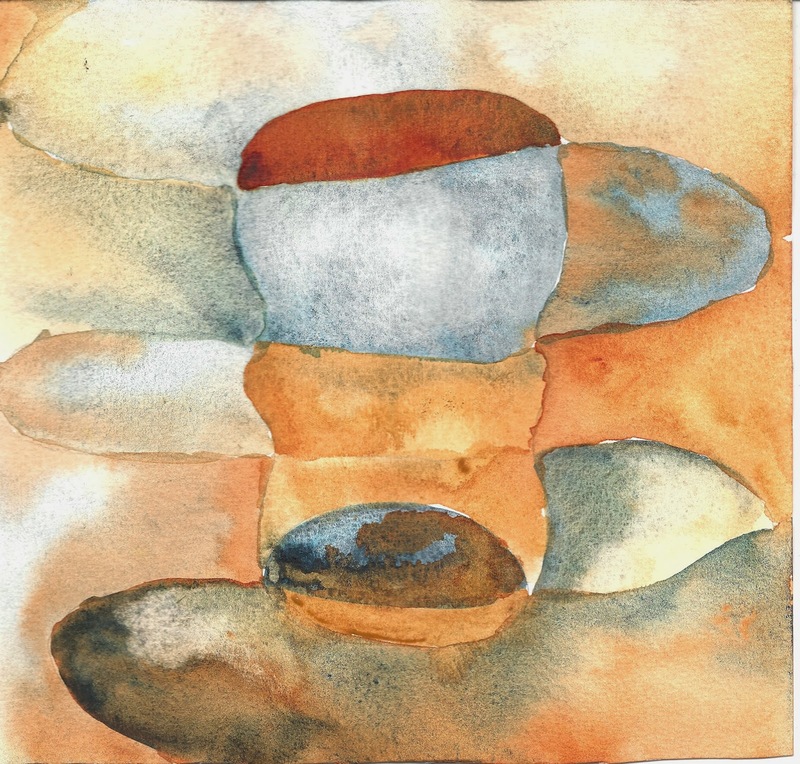 I felt the weight of the paper would be great for heavy mediums and collage so I decided to focus on those elements. I lay down fluid acrylics with just enough water to make it spread and then slathered on a thick layer of coarse molding paste (mixed with fluid acrylic). I combed through the paste and embedded some punchinella (sequin-waste) for texture. 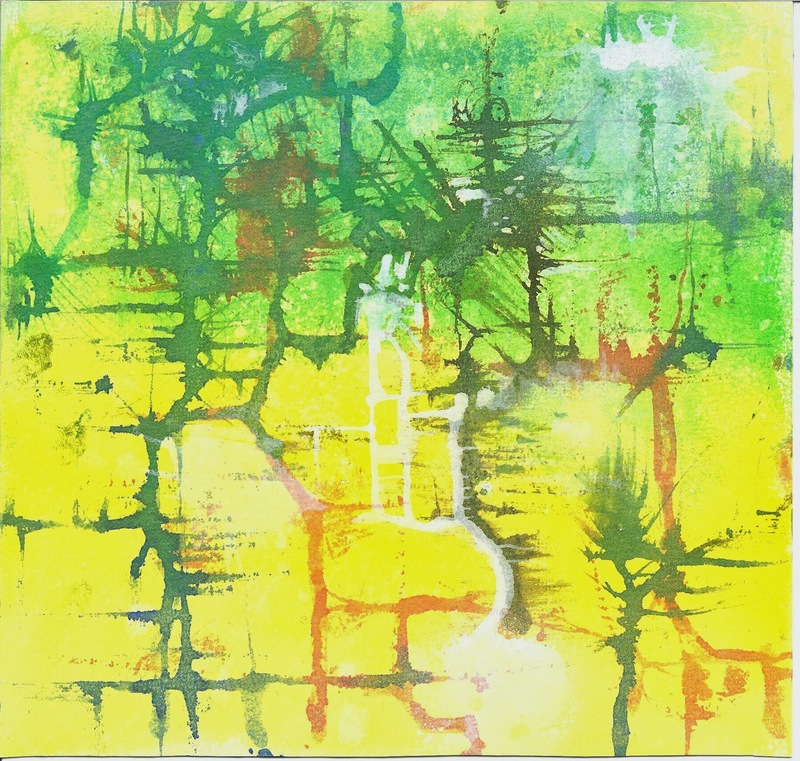 The result was a piece that ranged from thickly pasted in some areas to nothing but acrylic in others. There was a slight curving in the page that I straightened simply by curving it gently in the other direction for a few seconds. I’ve been wanting to play around with fusible webbing for a while now, so that was the focus for my second mixed-media piece. Fusible webbing is generally used to fuse two pieces of fabric together for easy sewing, but no reason you can’t fuse paper to paper. Again, I put down a layer of fluid acrylic to start with. 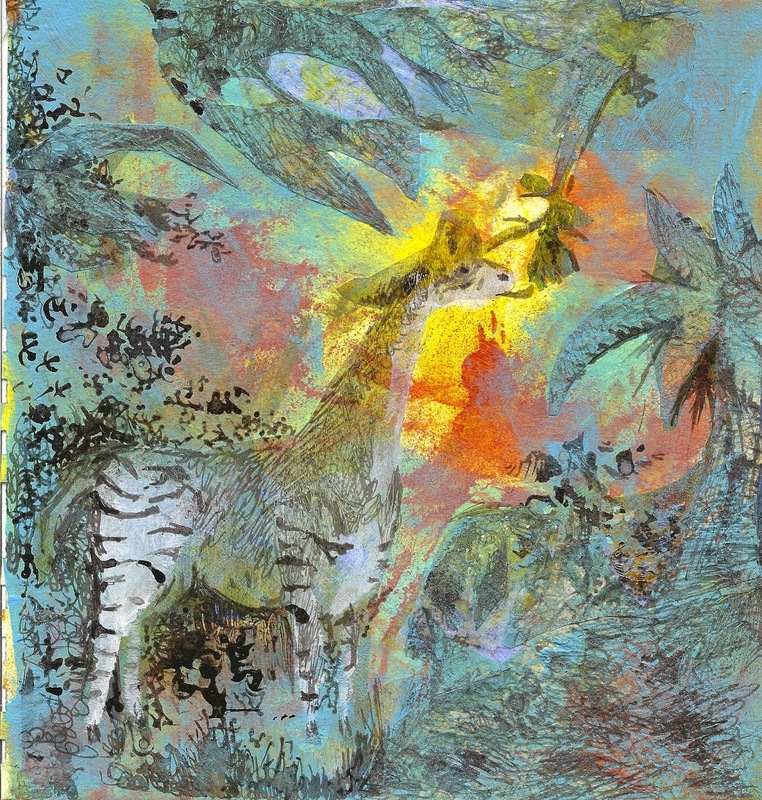 I cut out the shape of an animal (I think it’s an Okapi) and a palm tree and leaves, which I painted, and then ironed adhesive-side down onto the paper (I used parchment paper between the iron and the webbing). I then ironed on some scraps of masa paper that I had. It’s a thick, crinkly (well, it is after you crinkle it!) paper though it doesn’t weigh too much, so in some areas I also glued on more of it. I left some areas of the fusing uncovered. Afterwards, I added more fluid and high flow acrylic to fused areas that didn’t have masa paper, so it wouldn’t get stuck to anything else later. The completed piece is one with several different weights across the page. The webbing fused beautifully. When you run your finger across it, there is only the slightest edge to let you know where it is. The paper kept its shape totally–no curving at all. I started my exploration of the Clairefontaine Watercolor Pad feeling that it would be fantastic for Mixed Media and I ended up feeling that was completely true. It would be equally useful for colored pencil. I didn’t try pastel, but suspect it would do well. The surface would be a bit rough for fabric-tipped pens, but it is smooth enough that you could use them if you didn’t mind wearing them down a bit faster. It would also be great for fountain pen and metal-tipped pens. Oddly, I would be less likely to use it for the watercolor it was designed for. Not because I don’t like it for watercolor–I just wouldn’t be able to keep myself from using it with every other medium I had! When you do a review….you do a review. Thanks for all the info! I try to be as thorough as possible, lol! Hopefully, people will find what they want to know before they buy.